1. General access to the airport is restricted and we cannot allow visitors to enter the premises. The Festival of Flight 2017 is an opportunity to gain entry to the airport grounds and photograph the participating aircraft and the displays. If you do not want to attend the festival, you may prefer to take photographs from other viewpoints around Biggin Hill. All such images will be considered equally. 2. Please mark each photo with your full name, address & contact telephone number. Under 16’s should include DOB. Personal details will only be used for the purposes of administrating the competition. 4. Entrants can submit up to three photos in colour or black and white. We will accept both prints and electronic images with the mode and the overall clarity of the picture being taken into account at the judging process. please enclose a suitable stamped envelope. You may also be able to collect from the airport at the end of the competition (photo identification required). 6. 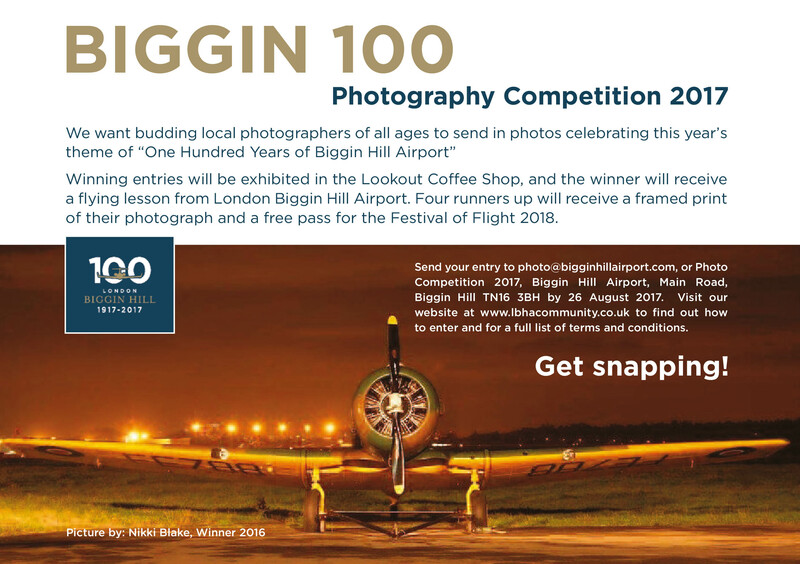 The competition is open to UK residents only, and we would particularly welcome submissions from Biggin Hill residents. In the interests of fair play, employees of Biggin Hill Airport and their family members will not be allowed to enter. 7. All entries must be the original work of the entrant. Please acknowledge ownership on the back of hard copies, and include metadata with electronic submissions. Any submissions found to be plagiarised will be discounted from the competition. 8. No professional photographers! This counts as anyone who advertises (and profits from) their services. We will discount submissions found to be from professionals. 9. Entries must not have won any competition prize previously. excessive photoshopping will be taken into account. We cannot accept superimposed or composite images. 11. Entrants are asked to submit the highest quality image they can. Pixelated images may be at a disadvantage if they cannot be enlarged and maintain their quality. Please do not watermark the image. written consent from parents and guardians where images of children are used, or we will be unable to accept the submission. 13. The Airport’s decision as to the eligibility of individual photographs will be final and no correspondence will be entered into. 14. Submitted photos will be the property of the airport and the airport has the right to use images for promotional purposes. The images, when used, will be accredited to the photographers (with their permission). 15. First prizes: please note that the photographer’s pass into the Festival of Flight 2018 will be subject to full security checks, and that the selected photographer will shadow another official photographer during the event and enjoy exclusive access to aircraft. 16. If the winner is unable to be contacted after reasonable attempts have been made, the Airport reserves the right to either offer the prize to a runner up, or to re-offer the prize in any future competition. 17. These rules are governed by the laws of England and Wales. 18. By entering, entrants agree to these terms.